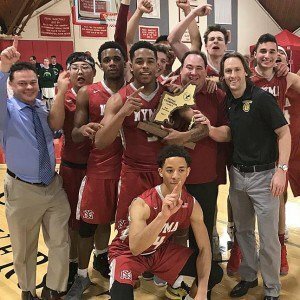 On Saturday, 3/3, the Varsity Basketball Team (22-3) traveled to the MacDuffie School who played host to the NEPSAC Semifinals. NYMA faced off against a tough Boston Trinity team. The Knights won by the score of 82-47 and were led by Zaahir Woody and Branden Evans who each scored 17 points. Will Mayfield had 14 points, Karif Isaacs had 13 points, Zamere McKenzie finished with 12, and Josh Antoine contributed 9 points. 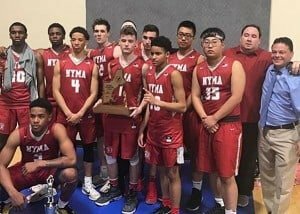 On Sunday, 3/4, NYMA played Rocky Hill School from Rhode Island for the NEPSAC Class D Championship at Clark University. NYMA won the highly contested game by the score of 52-47. The Knights were led by Will Mayfield who scored 17 points and Zaahir Woody who finished with 14. 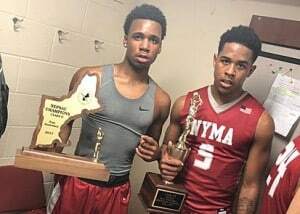 Zamere McKenzie had 9 points while Branden Evans finished with 8. Zaahir Woody was named the NEPSAC Class D Tournament Most Valuable Player. 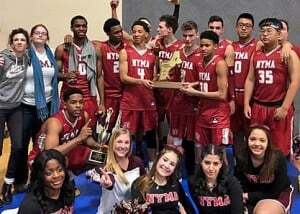 This was the first NEPSAC Championship for NYMA in any sport and the team dedicated it to Coach McMillen! Congratulations cadets and coaches on a fantastic season. You have made us all very proud!